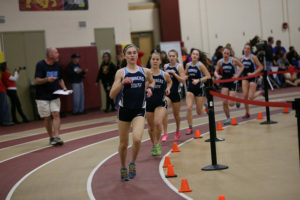 On Saturday, Feb.24, the DGS Girls Track & Field team traveled to Batavia to compete in a quad meet against Oswego, Glenbard North, and the host school Batavia. No team scores were kept as this was only the 2nd meet of the season, but the girls performed well and showed improvement over last week’s home opener. The Mustangs finished the day with three 1st place efforts. Erin Reidy (So) placed 1st in the 800m run with an excellent time of 2:19.57. In a dual with an accomplished Oswego runner (Isabelle Christiansen), Erin took the lead on the 2nd lap and slowly pulled away for the victory. Brenna Cohoon (So) led a host of Mustangs to the finish line of the 1600m race. Brenna led from start to finish to win with a season best time of 5:24.22. The DGS distance crew dominated the race finishing with the first 6 places, all within 7 seconds of Brenna. The 4x400m relay team of Kelley Hackbarth (Sr), Alisha Macas (Jr), Erin Reidy (So), and Becky Versaskas (Jr) won the final event of the meet with a great time of 4:11.99. Brenna Cohoon, Olivia Duax, Becky Versaskas, Melissa Weidner, Kennedy Warden, and Rebecca Diddia work together in the mile. The Mustangs also garnered several 2nd and 3rd place finishes. Maddie Manganiello (Sr) placed 2nd in the long jump with a leap of 16-7.5. Two DGS relay teams placed 2nd. The 4x200m relay team of Izzy Taylor (Sr), Asia Branch (Sr), Alexus Allen (Sr), and Clarice Maes (Sr) completed the race in 1:52.76. The 4x400m relay team of Kelley Hackbarth (Sr), Kennedy Warden (So), Melissa Weidner (Jr), and Alisha Macas (Jr) finished 2nd in 10:07.69. Becky Versaskas (Jr) and Kennedy Warden (So) finished close together in 2nd & 3rd places in the 1600m run with times of 5:26.76 and 5:26.81 respectively. Asia Branch (Sr) claimed 3rd place in the 55m dash with a time of 7.89 seconds while Clarice Maes (Sr) took 3rd in the 200m dash with a time of 28.38 seconds. Full meet results can be found on the Athletic.net website. All DGS individual results and splits can be found on the Schedule/Results page. Pictures from the meet (courtesy of Laura Duffy) can be found on the Pictures/Video page. The Mustangs will return to action next Thursday (March 1) at the 15-team North Central College Invitational. Author Coach PlunkettPosted on February 25, 2018 April 11, 2018 Categories Track & FieldLeave a comment on Batavia Quad Meet Results!